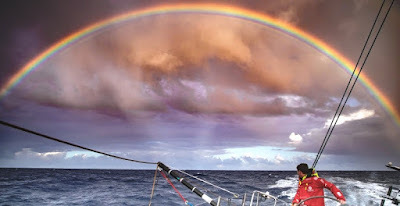 As temperatures rise and strong winds give way to localised storm activity on the approach to the Doldrums, the Volvo Ocean Race fleet is picking its way through the cloud systems, attempting to connect the dots, joining the wind pressure cells. It’s exhausting work for navigators and skippers in terms of decision-making, and for the crew moving the stack of sails on each gybe. At least some if not all of the teams have elected to ‘split the stack’, piling half the weight on each side of the boat, sacrificing righting moment for the ability to quickly gybe on each wind shift. In what has become a familiar refrain from several teams, gains and losses are coming quickly, with spirits rising and falling just as fast. “Yesterday, we had AkzoNobel 12 miles behind us, and we saw them catch a cloud and in two hours we lost like 20 miles, it’s crazy,” said Dongfeng skipper Charles Caudrelier.